PowerBall® Torch Consumables feature an all-copper current path for maximum conductivity and performance. The tip seats firmly in a copper insert within the diffuser with a smooth elliptical end. Traditional tip designs lose conductivity at this connection point since they are typically flat or tapered. The enhanced conductivity provides longer contact tip life with superior cooling. 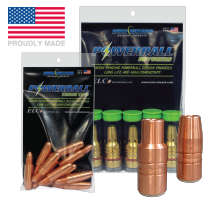 Boost the power of your torch with PowerBall® Consumables! 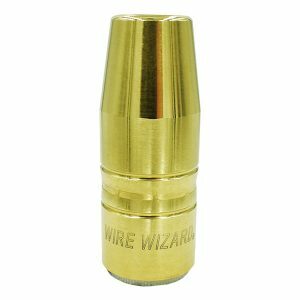 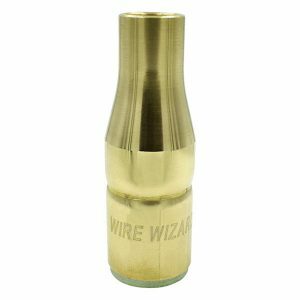 PowerBall® 1/2” (12.7mm) Nozzles for PowerBall® MIG Guns (all models) and other MIG Guns using PowerBall® Diffusers. 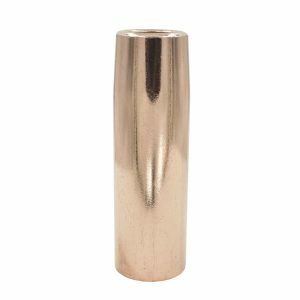 PowerBall® 5/8” (15.9mm) Heavy Duty Nozzles for PowerBall® MIG Guns (all models) and other MIG Guns using PowerBall® Diffusers.